What causes oily skin in African Americans and how do you control it? 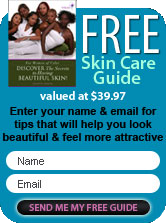 Are you challenged with caring for oily African American skin? Do you have oily skin and enlarged pores? While it's often assumed, but not necessarily true, not all African Americans have oily skin. There are several factors that contribute to oily skin and enlarged pores. Genetics is one reason but so is a hot humid climate and consumption of the wrong foods. Also, stress can trigger hormone's leading to the overproduction of sebum or skin oil. When excess oils mix with dead skin cells, it can lead to blemishes. However if your skin has consistent breakouts you should consult a dermatologist or skin care therapist/esthetician. Oily skin can be aggravated by the ingredients in some skin care products. A common misconception about oily skin is to over clean it and under hydrate it so having a black skin care regimen will enable you to set steps in place that will ensure success when caring for oily skin. � Cleanse your face morning and night to remove surface oils. While soap is often the cleanser of choice, it can actually dry your skin out and cause it to produce more oil. Cream cleansers work wonders for your skin, especially when they contain Green Tea. � Tone - Using a toner or mild astringent to bring balance to your pH level. Some astringents contain too much alcohol and are too harsh. They will strip the natural oil from your skin and cause it to over produce more oil. � Moisturize - Use an oil free moisturizer that hydrates inner layers without leaving your skin looking as though you've been basted and placed beside the Thanksgiving turkey. � Exfoliate your skin at least once a week with a natural exfoliant such as glycolic acid and/or a jojoba facial scrub to remove the dead cells. Jojoba wax beads, one of the ingredients in our jojoba facial scrub, will gently remove dead skin cells while melting into your pores and nourishing your skin outer and inner layers. Exfoliation will also balance your oil production and reduce the appearance of enlarged pores. Keep in mind that some scrubs that are used to exfoliate your skin can actually cause harm to it. So take caution with almond, walnut and peach scrubs. Any shells in a given product can cause scaring, scratches and bruising to your skin. Treating your oily skin with a gentle cleansing mask once a week or a natural clay or honey masque will work to remove oil and dead skin cells and to normalize your skin. While clay masque will remove the excess oils from your skin, a honey masque will hydrate your skin bringing the inner moisture that's often missing from your skin, even if it's oily. Protect your skin daily with a skin care regimen that works for women of color. Don't step outside your door without a sunscreen of SPF 15, no more than an SPF 30. Wearing hats, especially during spring and summer months will decrease the intense sun rays and help protect your skin. If you follow the suggestions made in this article, your skin will look and feel refreshed, less shiny and have a more radiant glow.